Whether executives or subject matter experts, accelerate the influencer status of your key personnel on LinkedIn & Twitter, to build a powerful expert message for your customers, prospects and the press. Build a fully tailored program including profile optimisation, personalised content curation, engagement strategies and more, ensuring keyword optimisation in alignment with expert knowledge. Ensure your investment works for the long-term using staged handovers to the end users and embed social business behaviours into your experts' daily routines. 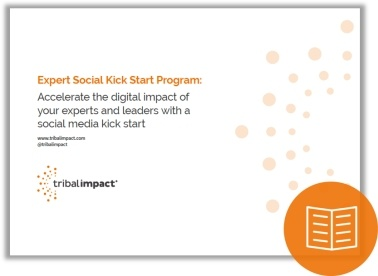 The Expert Social Kick Start Program is one of our most popular services. In brief, we help busy people get online quicker. We kick start their journey by optimising their existing profiles (LinkedIn & Twitter) with the relevant keywords and keyword phrases to help them be found. We work together with them to understand their line of business, audience and expectations. We construct a dedicated social listening dashboard that we use to manage their accounts for the first three months. Each month we report progress and recommendations. Our services help your busy experts and leaders create their social footprint, find and connect with influential peers and build their reputation from the ground up. A dedicated safe pair of hands tailored specifically to their needs. On completion of the kick start period, we can either hand back full control of the accounts to their owner with coaching to support the transfer, or, where there is limited time to manage the accounts, continue with a reduced service to "keep the lights on". Our pilot group results proved so successful that we are now rolling out your kickstart programme across EU, APAC and US. Working with you has also brought a more strategic approach to social selling. I thoroughly enjoyed working with your team. Your knowledge, openness, energy and genuine willingness to help and succeed is admirable! I would highly recommend you to other businesses. I hope our paths cross again in the future!